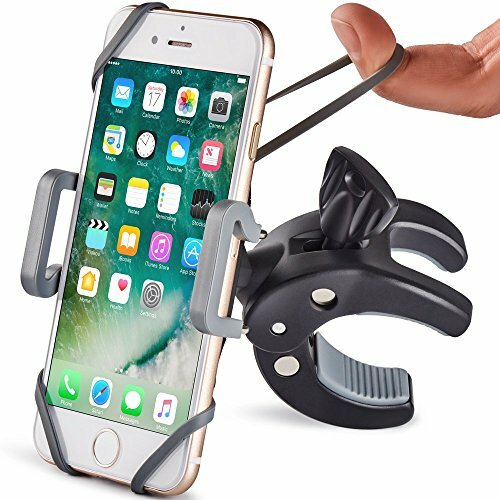 We carefully looked through all users reviews and complaints and developed our own CAW.CAR Accessories Extra-Thought-Out Universal CrowFoot Handlebar Phone Mount! We worked with strong attention to details and customers feedback. The universality of our patented CrowFoot handlebar clamp along with outstanding adjustability and safeness of the phone clip truly set our mount apart other designs developed in 2018 or earlier. You will definitely feel it, especially if you have experience with other mounts to compare. There is no doubt - this mount will perfectly suit your bike, no matter who you are - an elderly lady with an old school thin frame bike or a black-bearded biker riding a brutal Harley Davidson chopper. And don't worry, you do not need any tools to install this bike cradle, your skillful fingers will be just enough. No, you can't break it while installation or use, even if you try to, it's made of unbreakable metal (bar clamp) and highest quality plastic (phone clip). Order right now and when you do, consider getting two and get a discount... one for you and one as a gift for a fellow rider. OUT AND OUT UNIVERSAL - mount any cell phone to any bicycle, motorcycle or ATV with tubular handlebars (from 0.2" to 1.9" in diameter)! No tools for installation required. ADJUSTABLE GRIP WITH 360° ROTATION FREEDOM - simply adjust and secure your phone to any angle and position that suits your preference and enjoy the comfort of your ride!